Envolvida por uma zona rural onde predomina a agricultura de subsistência, é um excelente local para se deixar encantar pelo folclore e tradições do povo minhoto. Piscina para uso exclusivo de quem arrendar a propriedade. Very beautiful character house near to the ocean and other interest places! The house is very beautiful and typical. It is ideal for a group of 15 people ! We could enjoy the huge garden and the swimming pool plus visiting many interest places in the area (Guarda, Porto etc...). The owner was very nice and easy to communicate with. Thanks Valentin for choose Casa do Pinheiro Manso. It was a pleasure to meet you and i hope see you again in the future. We have just returned from 2 weeks in Tras O Rio, with a family party of 12. The property is magnificent. It is set in beautiful grounds with the best furnishing indoors. The owner, Francisco, could not have been more welcoming and accomodating, even driving us around the local sights with his English speaking daughter to accustomise us to the area. As mentioned in a previous review he even supplied us with boxes of wine following our arrival. There were around seven bikes available for our free use, with around 20 minutes ride to the nearest beach and supermarket. Overall a fantastic holiday . I would not hesitate to recommend Quinta Tras O Rio for any large gathering. Our stay at Quinta Trás o Rio was nothing short than magnificent. We were a group of 16 student friends from Germany and this house was the best place in Portugal to spend time together. 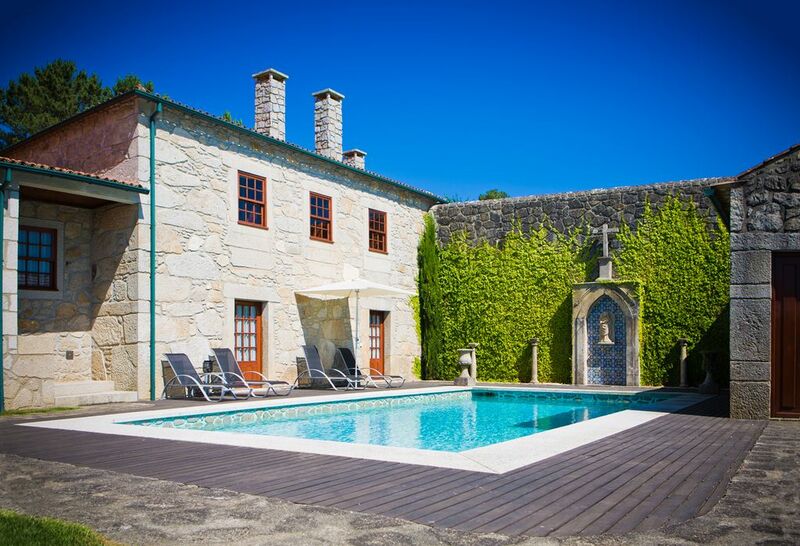 The villa and the surrounding garden are enormous and very spacious. The house is well equipped, well looked after and tidy, with enough bed- and bathrooms for this amount of people, plus a dining room and a living room. The kitchen provides everything one needs, there is even a brick oven for pizzas. The garden is really beautiful and every dinner we were sitting outside at a big table, having a barbecue or else, enjoying the surrounding area and the sun set. The house is set in a very friendly, rural area not far from the beach. You can easily reach it by bike or walking. The area invites you to do many outdoor activities. We for example had a wonderful time surfing, biking and hiking. Vila Praia de Ancora itself is quite a nice place to enjoy good restaurants, cafés or a stroll around the city. 3 Swedish families, 14 people, shared this beatiful house for a week! Our host, Fransisco was most friendly and helpful! The house was well planned and well equipped! We loved both the house and the beautiful garden surrounding it!